Confession: Fozzie Bear is my favorite Muppet. Not sure why, but his iconic “wocka wocka wocka!” probably has something to do with it. I love these adorable Fozzie Bear Cake Pops, the Reese’s hat is just the icing on the cake (pun most certainly intended!). After cake is baked and cooled completely, crumble into a large bowl. With a large spoon, mix thoroughly with about 3/4 of the can of frosting. You won’t need the rest. Roll mixture into quarter size cake balls and place on a wax paper covered baking sheet. Place cake balls in the freezer for about 15 minutes to firm up. You can transfer them to the refrigerator to keep chilled and avoid freezing. When they are firm, shape the cake balls to resemble Fozzie’s head. It should resemble a pear shape with the top of the ball smaller than the bottom. You can use a picture of Fozzie as a guide to help shape the cake ball. To form the mouth, use one of the prepared candy coating wafers to press into the shaped cake balls and make an indentation. You can then shape the lip over the top of the mouth. Repeat with remaining cake balls using one of the prepared candy coating wafers. Return to freezer for a few minutes to chill again and then transfer to refrigerator to remain firm, not frozen. While the shaped cake balls are firming up, prepare the hats for Fozzie. Melt chocolate candy coating and pour some into a small squeeze bottle. Pipe a small circle of coating on wax paper. Then press one mini chocolate peanut butter candy gently on top. Repeat for remaining hats and let dry. To form Fozzie’s ears, you will need to attach candy prior to dipping the cake pop in candy coating. Remove from refrigerator and use a little bit of melted coating to attach peanut butter candies on the side of Fozzie’s head. Be careful to leave enough room for his hat to fit in between. Place Fozzies with ears back in the refrigerator to remain firm. Prepare candy coating. (You can also do this prior to attaching ears.) Add orange candy coating to previously melted chocolate candy coating. The mixture of the two colors will create a burnt orange shade. Melt candy coating (half chocolate/half orange) in a heat-proof plastic bowl so that the coating is about four inches deep for easier dipping. Melt in the microwave in 30 second intervals on low, stirring in between. Repeat until melted and smooth. Remove a couple of shaped cake balls from the refrigerator at a time to work with. 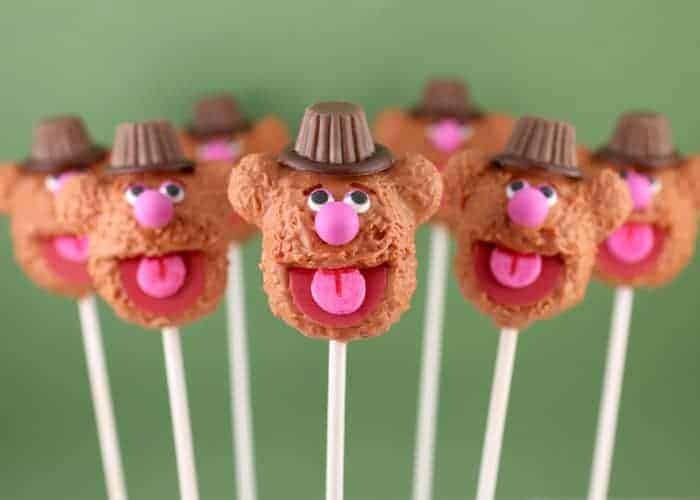 Dip the tip of a lollipop stick into the melted coating and insert into the bottom of Fozzie’s head. Carefully dip the entire cake pop with ears attached into the bowl of melted candy coating. Dip and remove in one motion without stirring. Make sure the entire cake ball is covered. Using a deep bowl is helpful here. If your coating is too thick, you can add a little vegetable oil or shortening to help thin it and make it easier to work with. Remove and allow any excess coating to fall off the pop and back into the bowl. Before the coating sets, gently press one prepared red candy coating wafer in place for the mouth and attach one hat on top of Fozzie’s head. When dry, attach two candy eyes using a toothpick to dot on a tiny bit of candy coating. Use the same technique to attach a round candy with pink shell in place for his nose and a prepared confetti sprinkle in place for his tongue. Let dry. Then use a toothpick to apply more candy coating all over the cake pop. It helps if the coating has started to cool a little in the bowl so when you apply it to the pop, it will hold its shape and resemble fur as you texturize with the toothpick. If desired, use a red edible ink pen to define his tongue and a purple edible ink pen to draw on eyelids. You can wrap in treat bags tied with a ribbon and/or store them on the counter or in an airtight container for several days. With secret, signature, celebrity cameos, Disney’s THE MUPPETS opens in theaters everywhere on November 23rd. oh wow, my mom just brought over a book of cake pops recipes for my kids- those are cute!